Product prices and availability are accurate as of 2019-04-17 16:41:46 UTC and are subject to change. Any price and availability information displayed on http://www.amazon.com/ at the time of purchase will apply to the purchase of this product. Our Polypropylene Cotton Gloves are designed for general purpose to protect your hands when needed at a lower cost. 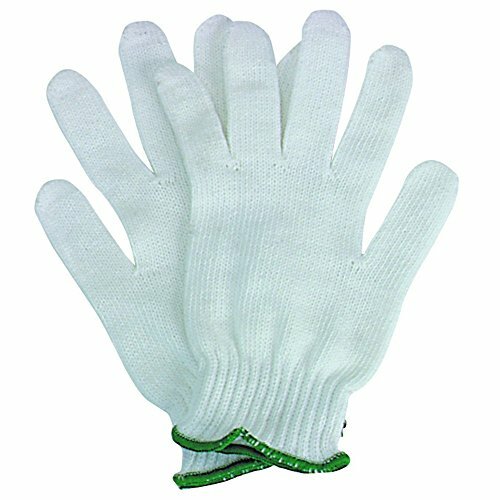 The cotton glove that is coated with polypropylene makes a great moisture barrier to keep your hands comfortable in damp weather. Inexpensive enough to be replaceable but made for a comfortable fit. The comfort level also promotes usage for you and your employees which help to keep you comfortable. These gloves also make a great liner over bulkier gloves in colder weather. These gloves will fit over top of a vinyl or latex glove for an extra line of defense while providing an effective temporary barrier against harmful contaminants. You receive 12 gloves, a total of 6 pairs, with an elastic wrist band to keep water and cold away from your hands. These gloves are ambidextrous so if you lose one glove you can just grab another out of your pack of 12 to replace it.